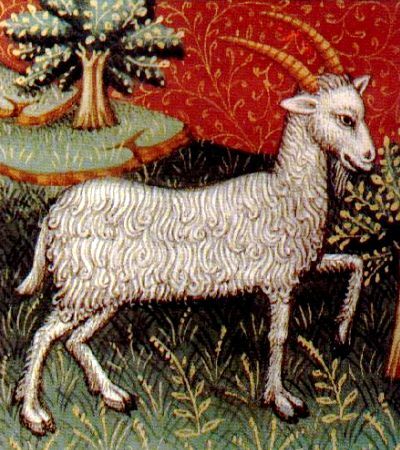 Capricorn (♑) is the tenth astrological sign in the zodiac, originating from the constellation of Capricornus. It spans the 270–300th degree of the zodiac, corresponding to celestial longitude. Under the tropical zodiac, the sun transits this area from December 22 to January 19 each year, and under the sidereal zodiac, the sun transits the constellation of Capricorn from approximately January 16 to February 16. In astrology, Capricorn is considered a negative sign, and one of the four cardinal signs. Capricorn is third and last of the earth signs in the zodiac, the other two being Taurus and Virgo. Capricorn is said to be ruled by the planet Saturn. 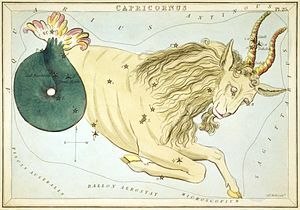 In astronomy, Capricornus is one of the 88 modern constellations, and was also one of the 48 constellations listed by the 2nd century astronomer Ptolemy. Under its modern boundaries it is bordered by Aquila, Sagittarius, Microscopium, Piscis Austrinus, and Aquarius. The constellation is located in an area of sky called the Sea or the Water, consisting of many water-related constellations such as Aquarius, Pisces and Eridanus. It is the smallest constellation in the zodiac. The symbol of Capricorn is based on the Sumerians’ primordial god of wisdom and waters, Enki with the head and upper body of a mountain goat, and the lower body and tail of a fish. Later known as Ea in Akkadian and Babylonian mythology, Enki was the god of intelligence (gestú, literally “ear”), creation, crafts, magic; and water, both seawater and lake water. Individuals born between December 21 to January 19 may be called Capricornian. Despite its faintness, Capricornus has one of the oldest mythological associations, having been consistently represented as a hybrid of a goat and a fish since the Middle Bronze Age. First attested in depictions on a cylinder-seal from around the 21st century BC, it was explicitly recorded in the Babylonian star catalogues as MULSUḪUR.MAŠ “The Goat-Fish” before 1000 BC. The constellation was a symbol of the god Ea and in the Early Bronze Age marked the winter solstice. In Greek mythology, the constellation is sometimes identified as Amalthea, the goat that suckled the infant Zeus after his mother, Rhea, saved him from being devoured by his father, Cronos. The goat’s broken horn was transformed into the cornucopia or horn of plenty. Capricornus is also sometimes identified as Pan, the god with a goat’s head, who saved himself from the monster Typhon by giving himself a fish’s tail and diving into a river. Due to the precession of the equinoxes the December solstice no longer takes place while the sun is in the constellation Capricornus, as it did until 130 BCE. The sun’s most southerly position, which is attained at the northern hemisphere’s winter solstice, is now called the Tropic of Capricorn, a term which also applies to the line on the Earth at which the sun is directly overhead at noon on that solstice. The solstice now takes place when the Sun is in the constellation of Sagittarius. This year, in 2018, the sun is in Capricornus from January 19 to February 16. However, the sun’s passage through the sign Capricorn happens from the December 21 solstice to January 20, about one month earlier. The mountain goat part of the symbol depicts ambition, resolution, intelligence, curiosity, but also steadiness, and ability to thrive in inhospitable environments. The fish represents passion, spirituality, intuition, and connection with the soul. As Capricorn is the cardinal earth sign, it is the sign of foundation, of taking the base material and making something out of it, something that impresses and lasts. It’s the archetype of the Builder, the one who puts use to everything at our disposal. And it’s necessary for our survival, as the emergence of this sign on the winter solstice reminds us – the darkest day of the year, when only our own abilities can guarantee our existence, since nature’s resources have abandoned us. It’s what makes us persevere. 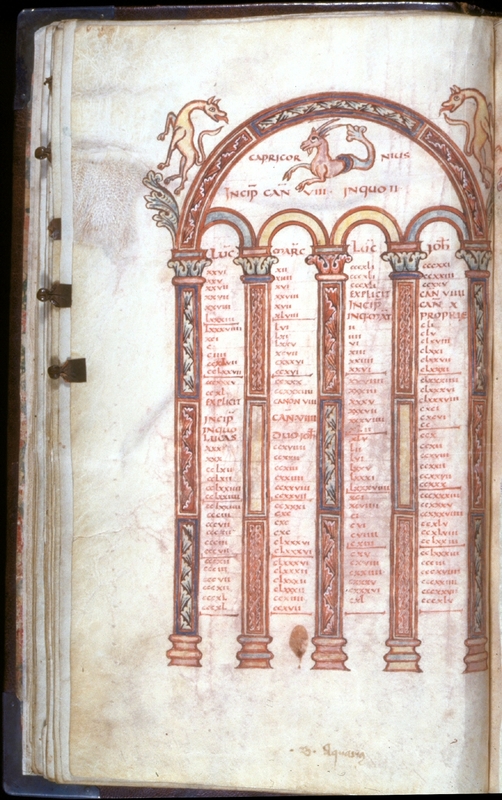 This entry was posted in Archetype and Myth, Natural World, Seasons and tagged archetype, astrology, astronomy, Capricorn, constellation, Ea, Enki, fish, mountain goat, stars, winter solstice, zodiac. Bookmark the permalink.